Krishna Sobti, the master of prose whose works like 'Mitro Marjani, 'Zindaginama and 'Surajmukhi Andhere' delighted readers, died today in Delhi, at the age of 93. She was in the ICU of a city hospital for the last two months for age related illnesses. 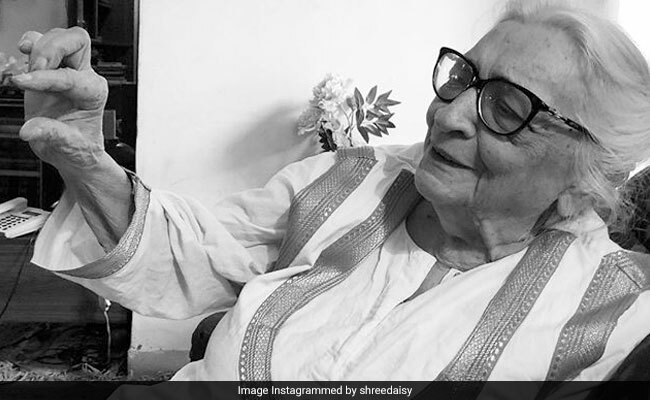 "She was about to complete her 94 in February..Even after being extremely sick, she was very much aware about her thoughts and about what was happening in the society," said Ashok Maheshwari, a friend and managing director of Rajkamal Prakashan. "Krishna ji was one of the most sensitive and alert writers of our times. She created her own identity and dignity in the field of literature," Mr Maheshwari said. Her latest book 'Channa' was launched at New Delhi World Book Fair on January 11. The book was written 60 years ago but was never published. Born in 1925, in Gujarat province of Pakistan, Krishna Sobti was a prominent voice who raised issues of female identity and sexuality. She won the Jnanpith Award in 2017. She was also the recipient of the Sahitya Akademi award and the Padma Bhushan, which she had declined. Krishna Sobti was often referred to as "trustee of Indian democracy" through her contribution to literature. "What she has done for Indian literature is unmatched. Her social message was very clear through her works...she fought for equality and justice throughout her life. She was not just an eminent author of Hindi, but the entire Indian literature," said author-poet Ashok Vajpeyi. Calling her death as a "loss for world literature", poet Ashok Chakradhar said that she was the "pioneer of writing for women's honour".